The State Museum of Oriental Art in Moscow recently unveiled an exhibition dedicated to the 90th birth anniversary of Mai Miturich, a famous Russian illustrator. Several journeys to Asia inspired him to illustrate Indian, Chinese and Japanese fairytales. Miturich’s illustrations of Rudyard Kipling’s The Jungle Book have been popular with children for several decades. Mai Miturich-Khlebnikov, better known as Mai Miturich, was born on May 29, 1925 in a family of two avant-gardists - Petr Miturich, and Vera Khlebnikov, who was renowned Russian poet Velimir Khlebnikov’s sister. “Being born in such a family, I was destined to become a painter,” Mai Miturich said in an interview in 2004. When the Second World War erupted, the 17-year Mai volunteered to join the Red Army, where he made big agitprop posters along with other military painters. He was in Berlin when the war ended and was rewarded with the Order of the Patriotic War- Second Class (one of the most respected Orders in Soviet times). He studied further after the war and became a book illustrator. His first series of artwork was published in 1957 in a book of Chinese fairytales titled The Golden Lantern. Miturich first got interested in the Asian culture and nature in the 1960s, when he traveled to the Soviet Far East. In the 1970s, Miturich visited Japan, Thailand and India. He travelled to India specifically to illustrate Rudyard Kipling’s The Jungle Book. “I did Mowgli twice,” he said in an interview in 2002. “I did it for the second time in India. There was so much sun and light, that I decided to redraw everything, to make it brighter.” After having seen Miturich’s works from India, editors from a Soviet publishing house canceled an earlier order from another illustrator and decided to use Miturich’s illustrations. In 1976, the book with illustrations of Mowgli was published. The publishers decided to print 150,000 copies of the first edition. Over the last 40 years, the book has been republished eight times. Miturich also illustrated Homer’s Odyssey and Kipling’s The Cat that Walked by Himself. He traveled extensively across Asia, and liked Japan the most. “He liked Japanese people and the feeling was mutual,” his daughter Vera Miturich told RBTH. He first visited Japan in 1966, as part of a Soviet delegation of painters. 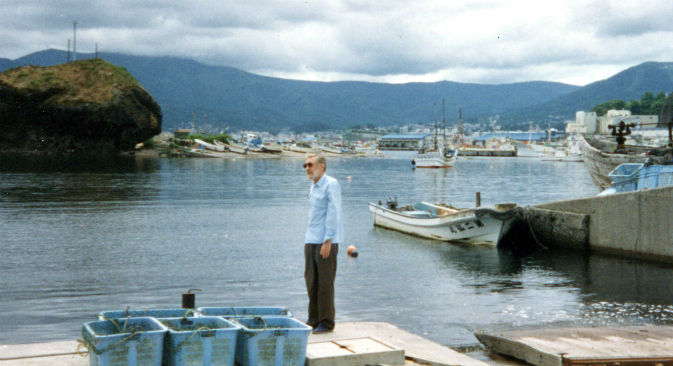 A few years later, a Japanese businessman and art collector invited Miturich to visit him in Hokkaido. The Russian illustrator spent two years in the northernmost Japanese island. Vera Miturich said her father had a sharp focus on his job there, and that his time in Hokkaido was one of the most productive periods of his life. Before returning to the USSR, he left most of his work in Japan as a gift. Most of his artwork is kept in private galleries in Japan. Miturich returned to Japan four times and got to know many Japanese publishers and illustrators. In 1983, his collection of Japanese fairytales with illustrations titled The Folk Tales of Japan was published. Almost 100,000 copies of the book were sold in Japan. In the beginning of 2000s, Miturich met Japanese calligrapher Ryuseki Morimoto in Moscow. Despite the fact that he didn’t speak Japanese and never learnt the basics of traditional Japanese art, in 2002, the Russian-Japanese duo launched a project called Touch Points. Morimoto calligraphed poems of Matsuo Basho and Masaoka Shiki and Mituritch drew the illustrations. “It feels like the poems and the illustrations were the work of one person,” Svetlana Khromchenko, curator at the State Museum of Oriental Art in Moscow told RBTH. In 2005, Miturich was rewarded by the Emperor of Japan with an Order of the Rising Sun for creating a bridge between the two cultures. Miturich, who spent a significant part of his life in Asia, passed away in 2008. His daughter Vera became a book illustrator and is keen to promote her father’s legacy.